Zuma doesn’t understand economy or white people: ‘truths’ about ‘monopoly capital’. Brilliant analysis! The state of the nation address was a predictable circus. Jammed between the insults and foul language were a few legal arguments about why the president is a “constitutional delinquent”, but little by the way of robust debate. Unfortunately, for now, the systemic weaknesses in our electoral system and the resultant manner in which parliament is constituted, enables an evidently delegitimised president to stay at the helm. The increasingly aggressive and authoritarian Julius Malema and his crew, would do well to recognise that their energy is being wasted and could be more effective is redirected at electoral reform. In spite of the predictable shenanigans that marred our national AGM, it really was a tale of two speeches. In the first half the president spoke of the need for economic growth, investor confidence and streamlining the process is for would-be entrepreneurs from abroad. This, I am sure, was music to the ears of the corporate elite. Unfortunately, about halfway through, the economic wheels came off. 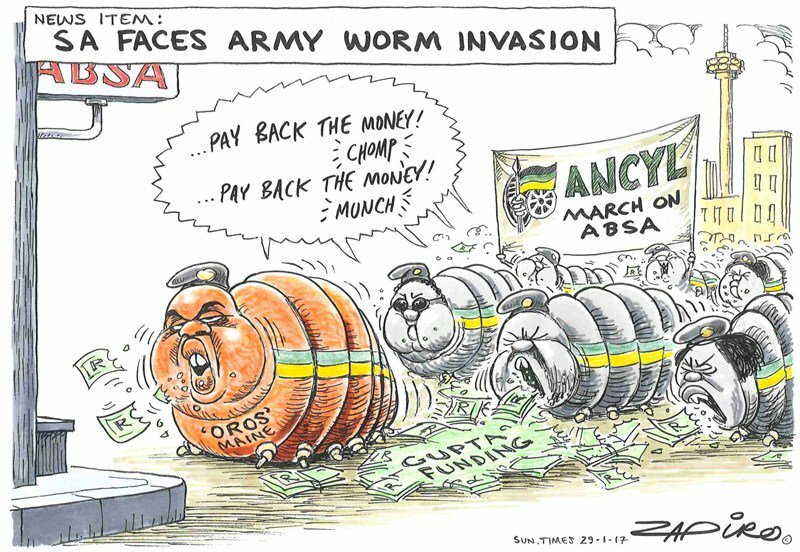 The president spoke repeatedly about black people, black ownership and black economic emancipation, except everything he proposed to do is guaranteed to undermine the economic interests of the black majority who he reportedly represents. Here is a taste: the president promised that R100 million would be spent on improving our ports and that black people would benefit from this state expenditure. At an average wage of R200 000 per annum (cost to the state), this would better the lives of 400 South Africans. This would be a once off opportunity for employment, after which our dwindling mining sector and stalling manufacturing sector would have the benefit of improved export infrastructure. When you have an unemployment rate near 30%, which translates into more than 10 million unemployed South Africans of working age, 400 temporary employees on the public payroll is a drop in the calabash, Mr President. The president does not understand our economy. The jobs in our economy do not come from state expenditure or state procurement. These are by definition costs to the public purse and paid for using taxes derived from private enterprise. Yes, through state owned enterprises, previously innovative and efficient, South Africa’s government historically spawned the conditions for industrialised job growth – it’s called state capitalism. But the president did not mention these enterprises once in his address! The president lives in a 1980 Kremlin-like bubble, where the state is the main actor and private enterprise the necessary evil in a socio-economically unequal society. The president lives in economic lala-land. In reality, more than 87% of South Africa’s GDP, sits in the private sector. The vast majority of productive, tax paying jobs, sit in the private sector. The innovation, the energy and the professionalism that can save South Africa, sit in the private sector. For all the talk about white monopoly capital, there is very little understanding of the true nature of either the whites or the capital of the country. The greatest example of monopoly capital in South Africa is Eskom, and Transnet and SAA. These monoliths, and their roughly 500 state agencies, monopolise key sectors of our relatively small economy. Of course there is too much consolidation in retail, construction and the agricultural sectors. Of course the president’s promise to diversify the players in these sectors would go some way in making black entrepreneurship more possible. But, the large scale, long term, labour absorptive economic growth that the country requires will not come about by slicing up the economic pie in ever smaller slices. It will come from baking an entirely new economic cake for all to enjoy a share of. To do so, the “black majority” need their “white capitalist” friends, in a partnership which aims to make South Africa a more competitive player in the global economy. The current race-based domestic power-play which the president is furthering is a dead end of parochialism and economic stagnation. 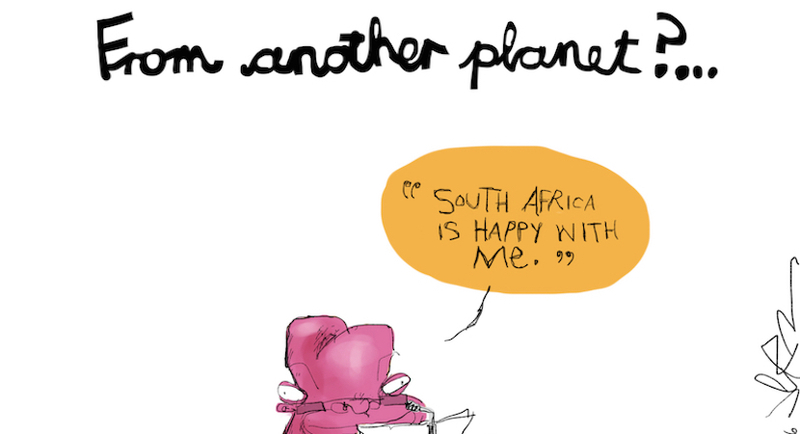 South Africa needs a plan. Not another 400 page National Development Plan. South Africa needs a three page strategic economic master plan, and the budget speech must be the instrument used to place rapid inclusive economic growth at the centre of our national agenda. Instead of telling us how we will “create jobs” through procurement and programs run by the state, the minister of finance (whoever he or she is), needs to use the budget to explain to South Africans and the international investor community, how we will position ourselves to be the most attractive destination for productive capital. Instead of teetering on the fiscal cliff where our sovereign debt flirts with 50% of GDP, the minister should embrace the notion of strategic and targeted investments by the state to make South Africa an economically competitive player for things like beneficiation and professional services. This is the only way to migrate our dwindling first economy to a thriving second economy, expand our constrained second economy into an engine for low skilled job growth, and provide a innovative platform for our third economy, services, to springboard into the continent and the globe. 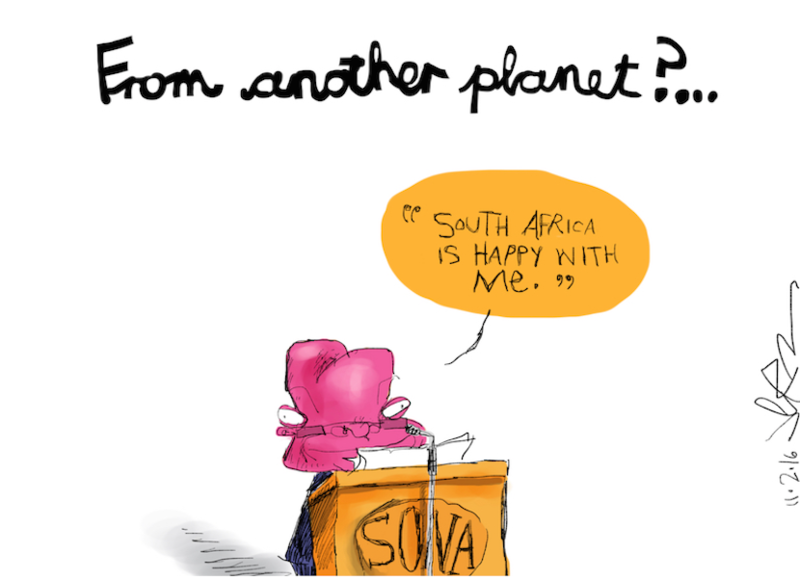 It was telling that COSATU withdrew their support for the Deputy President’s minimum wage deal shortly before SONA. Perhaps they are realising, like many of us have for a long time, that blue-collar workers are not representative of the South African population. The majority of our people are not looking for a living wage, they are looking for a wage, period. This means our government should abandon their pseudo-socialist pipe dream and throw their lot in with the very capitalists who are currently paying the bills. It is this, Mr. President, that will best serve the black majority and bring about radical economic transformation. Marius Oosthuizen is Lecturer in Strategic Foresight (Leadership, Strategy & Ethics) at the Gordon Institute of Business Science (GIBS), University of Pretoria. He is also Program Manager: Future of Business in South Africa.